Shallow groundwater is a condition where the seasonal high groundwater table, or saturated soil, is less than 3 feet from the land surface. There is a large portion of the state (more than 50 percent) where the seasonal high water table is located less than 3 feet from the surface. In these areas it may be impossible to get the 3 feet of separation from the bottom of an infiltration practice to the seasonal high water table REQUIRED under the NPDES Construction General Permit (CGP). Non-infiltration BMPs, such as lined filtration or settling practices, should be considered in areas with shallow groundwater. 1 Why is shallow groundwater a concern? 3 What are general stormwater management guidelines for areas with shallow groundwater? Why is shallow groundwater a concern? Removal of some pollutants (e.g., bacteria) can occur in the vadose zone beneath the base of the BMP. Pollutant removal in the vadose zone is attained via biological activity, chemical degradation, adsorption of pollutants to soil, and plant uptake. Shallow groundwater reduces the depth of the unsaturated soil available for treatment, leading to an increased likelihood of groundwater contamination. The vadose zone is further reduced when a groundwater mound forms. These sites present challenges to stormwater management, however these challenges can be managed. General guidelines for investigation and management are presented in the following sections. Investigations are recommended for all proposed stormwater facilities located on sites with a suspected shallow groundwater table. The investigation should be two-fold. First, appropriate screening tools such as soil surveys, geologic atlases, or well records should be used to determine the likelihood that the groundwater table is shallow. If a shallow groundwater table is present, a geotechnical investigation should be conducted. Geotechnical investigations are recommended for all proposed stormwater facilities located on sites where it is suspected that the 3 foot vertical separation between the base of the BMP and the groundwater table might not be achievable. This is needed to show that requirements of the CGP have been met. The guidelines for how to investigate for shallow groundwater are summarized below. Guidelines for investigating all potential physical constraints to infiltration on a site are presented in a table at this link. These guidelines should not be interpreted as all-inclusive. The size and complexity of the project will drive the extent of any subsurface investigation. Regardless of the results of the initial site screening, soils borings and infiltration tests should be performed to verify site soil conditions. What are general stormwater management guidelines for areas with shallow groundwater? Conduct thorough geotechnical investigations with geotechnical analyses similar to those recommended for karst regions. Conclude the site to be infeasible for infiltration BMPs where a minimum 3 foot separation between the bottom of the BMP and groundwater cannot be achieved. The CGP prohibits infiltration BMPs when the separation distance is less than 3 feet. Consider stormwater wetlands which require a shallower ponding depth than stormwater ponds. The disadvantage of stormwater wetlands is that the shallow depth of the wetlands often creates footprints that are larger than ponds. Consider a stormwater pond that will intercept the groundwater table. This approach requires close examination of the land uses to assess the potential for stormwater hotspot or other highly concentrated runoff sources that would contribute excess pollutants to the groundwater. 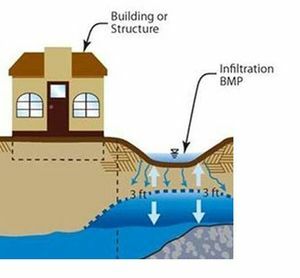 If the area is a potential stormwater hotspot and there is less than 3 feet of separation from the seaonally high water table, or if the area is a confirmed stormwater hotspot, a Level 1 liner is recommended to protect against groundwater contamination. MPCA is often asked why it allows a sedimentation pond (no liner) to be constructed that may intercept the water table, but require a minimum of 3 feet of separation from the bottom of any constructed infiltration practice and the water table. The treatment processes for these two practices are very different and may help to explain the requirements. A stormwater pond achieves pollutant removal through the process of settling of suspended solids. If the basin is large enough, contains vegetation, and has a long detention time, additional treatment through biological uptake and microbial action can also occur. An infiltration practice removes pollutants through filtering that occurs in the minimum 3 foot unsaturated soil layer beneath the practice along with the biologic and microbial activity that takes place in the layer under aerobic conditions. This page was last modified on 9 February 2017, at 10:54.